That's what Earl Weaver, legendary manager of the Baltimore Orioles, wanted on his tombstone, and it will be repeated a hundred times in the obituaries that are already starting to appear. Sports is narrative. It can be a long, sprawling novel, like the epic century-long Curse of the Babe. It can be a short story, like the Orioles Magic of 2012. Or it can be a tweet, like a really intense at-bat. 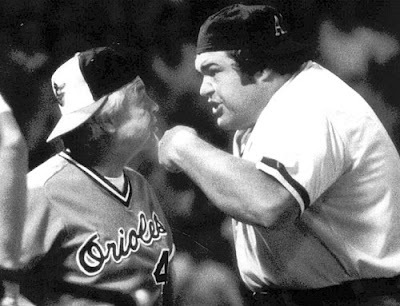 One of the great characters of baseball was Earl Weaver, whose fiery showdowns with umpires constituted one of the great serial stories of my childhood. Baseball cap turned backward so he could really get up in the umps' faces, his short stature only made his fury that much more explosive. He was ejected from games more than any other manager in the American League, often kicking dirt onto home plate on his way out. But Weaver brought more than fire to the game. He brought joy, enthusiasm, smarts, and one of the winningest records in all of baseball history. All hail the Duke of Earl.